SMA Series | Japan Aviation Electronics Industry, Ltd.
SMA series coaxial connectors are small size, with threaded coupling, conforming to the general-purpose standards (IEC60169-15). It enables high density packaging inside equipment, as well as compact interconnection between subassemblies and between units. Applicable frequencies: DC-3GHz(cable harness) High performance with a V.S.W.R. (Voltage Standing Wave Ratio) of 1.2 or less. A wide variety of products, Panel mount receptacles, enable diversified mount styles. Lightweight, compact in size and rugged construction. A high degree of reliability provides stable electric continuity and high frequency performance. 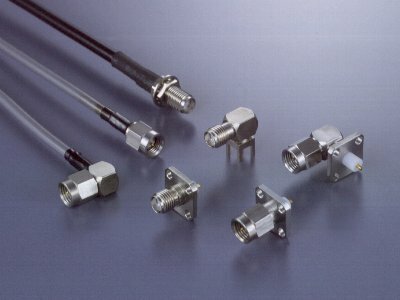 Products applicable over 3GHz are available. For detail, please consult us. In addition to independent cable application type, we also harness products which satisfy your specification are available. center contacts: 4 milliohm max., outer contacts: 4 milliohm max.